One of the dangerous maneuvers a motorist makes is backing up. When backing up a motorist runs the very real risk of colliding with another vehicle, an object, or even a pedestrian. 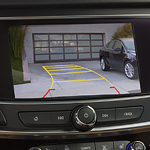 A backup camera is a safety device that markedly reduces the risk of a collision of any type when backing up. A back up camera, also known as a reversing camera, is mounted at the rear of a vehicle. When the car is put in reverse, a backup camera transmits video of what is behind the vehicle onto a screen located on the dashboard. If you have any questions about a backup camera, and its benefits, visit us at Betterway Sales & Leasing. We are located conveniently in Stoney Creek. Our experienced, professional crew is ready to provide you any information you may need about a backup camera or other safety features on your vehicle.